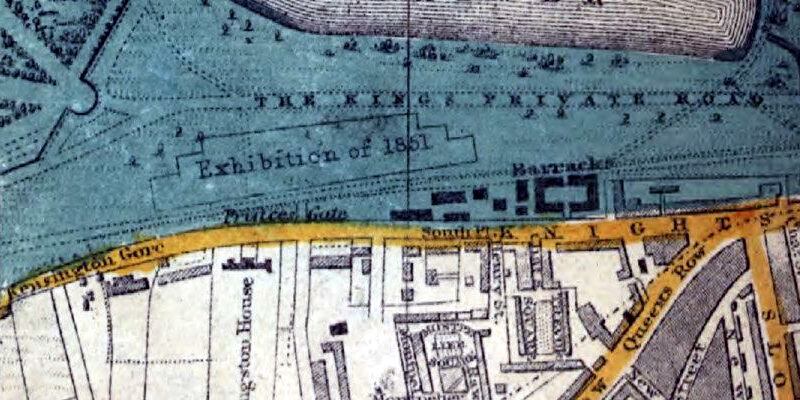 Above: Part of Cary’s map of 1796 showing the Isle of Dogs as being almost completely empty land. Notice the ‘Poplar Gut’ caused by flooding in 1660. 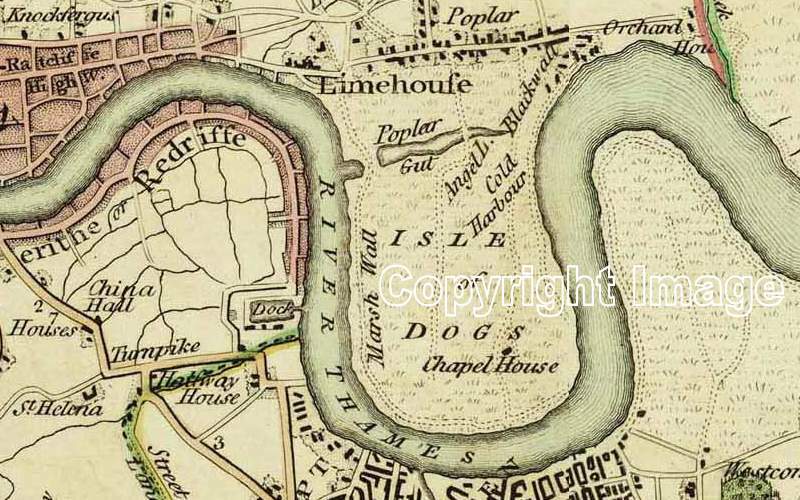 Because names on the Isle of Dogs may not be familiar to all readers, two maps have been shown – one from 1796 and the other of today. Between the two maps, it should be possible to relate the places shown to the narrative. There is a separate blog titled ‘Isle of Dogs as a Name’ which explains how the land gained such an unusual name. The so-called Isle of Dogs has always been a peninsula and not an island because it has always been joined to land at the northern end – where the original village of Poplar developed. In the early days – from the 1100s and the 1200s – the land was flat and marshy. Most of the land was only a few feet above the height of high tide and often subject to flooding. The land was then called ‘Stepney Marsh’. The name ‘Isle of Dogs’ came centuries later. Around the perimeter of the land, a dyke had been constructed probably in Saxon or Norman times, in an attempt to prevent flooding of what was then mainly pasture. 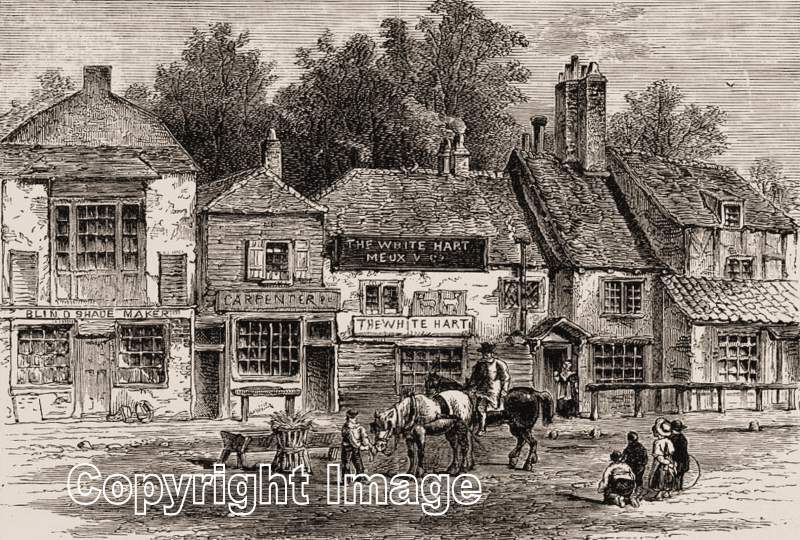 At the NE ‘corner’ was a small hamlet beside the Thames which was overshadowed by the muddy dyke which acquired the name ‘Blackwall’ – a name which is still in use today. On the west side of the Isle of Dogs, several windmills were constructed on top of the dyke which gave that part of the ‘island’ the name of ‘Millwall’. Made of earth, or earth and chalk, possibly with a timber core in places, the dimensions of the dyke varied in different places. In the narrowest parts, where it was more than 15 feet high, the flat top was about 18 feet across with slopes to both river and marsh giving it an overall width of up to 150 feet. Breaches in the dyke occurred at Saunders Ness in 1652, which is the most easterly point of the ‘island’. More seriously in March 1660, there was a breach to the south of Limekiln Dock caused by ballast-digging on the foreshore. Several acres of land was lost to the river and a large pond or ‘gut’ formed. The owners successfully claimed compensation for the flooded land from the commissioners. The Breach and the Gut remained until the construction of the City Canal (later formed into a third West India Dock called ‘South Dock’). Above: The Isle of Dogs shown on Google maps. Place names are labelled in YELLOW. Old dock systems are labelled in BLUE. The West India Docks were constructed between 1800 and 1802. There were two docks running parallel to each other, virtually creating an island of land to the south. The City Canal was unprofitable and the land was acquired by the West India Dock Company who widened it into a third parallel dock in the 1860s. It was then known as ‘South Dock’ – a name still in use today. With an entrance on the west side of the Isle of Dogs, the two docks forming the Millwall Docks were created in 1868. They form a reverse letter ‘L’ in shape and were originally constructed to increase the length of available wharves for cargo ships to load and unload. Their shape remains today and can be seen on a modern map. When the docks were in their heigh-day, the Isle of Dogs was a remarkable place. Working in the docks were thousands of men who lived locally in small terraced houses. Looking at the size of the docks and the amount of land that they took up – including the wharves and the warehouses – there hardly seemed to be enough space of the dockers and their families to live. Not only was that the case but there were many large industries also operating on the ‘island’ and their workers also lived nearby with their families as well. In addition, there were schools, churches and pubs to be ‘squeezed in’. For transport, the residents relied entirely on buses for transport. There were then no train services and no underground lines either. The docks slowly declined from the 1960s onwards and by the end of the 1970s, no docks were operating at all. All industry went into decline at the same time. The heavy bombing of the Isle of Dogs during the Second World was another factor – rendering some docks unusable and destroying several factories. Streets were also bombed and, after the Second World War, some of the housing was replaced by tower blocks and Council estates. After nearly four decades of decline, something had to be done. Redevelopment was the answer, according to the Government of the day and, in 1981, the London Docklands Development Corporation (LDDC) was given total freedom over the local area to develop as they saw best. There were not many options. The Isle of Dogs was bounded on three sides by the Thames. The old roads – Westferry Road, Manchester Road and Preston’s Road – could not be made into a dual-carriageway because they led nowhere. For public transport, the only solution was to install a new ‘light’ railway which became the Docklands Light Railway (DLR) that we know today. It was a rapid transport system but even that could not transport the vast number of office workers required at Canary Wharf. A new underground railway was eventually constructed – the Jubilee Line which opened in 1999, linking Canary Wharf with Stratford in the NE and Central London in the west. At the time of writing, we are waiting for the new Crossrail line which will link Canary Wharf with London Heathrow Airport in the west and Essex and North Kent to the east. The large development known as Canary Wharf became rather like a new mini-city. It has its financial centre in the high-rise offices. Many of the workers live within walking distance of their offices. During their lunch-break and after work they have several shopping precincts – providing not only all the food-shopping and clothes-shopping that anyone could ever need but a vast array of restaurants and entertainment, including a cinema and concert hall. Canary Wharf has become almost completely self-sufficient. The SW part of the Isle of Dogs is known as Millwall. That name derives from the fact that there were several windmills built on the dyke at that point, taking advantage of the prevailing winds from the west. The SE part of the Isle of Dogs is often called Cubitt Town. It was named after William Cubitt, Lord Mayor of London who, in the 1840s and 18450s, developed streets of houses as well as a new parish church. Most of the docks still remain today but they have been put to different uses. The planners from the time of the LDDC made certain there were also large public open spaces to enjoy. There are several parks and there is even an inner city farm! More people are living on the Isle of Dogs now than ever before. Not everything has yet been resolved. Some of the new residents live in the most opulent apartments while, only a matter of hundreds of yards away, there are still run-down Council estates and unemployment endured by many for whom the dream of a better life is still to be realised. See also: Isle of Dogs as a Name – 11 June 2015. 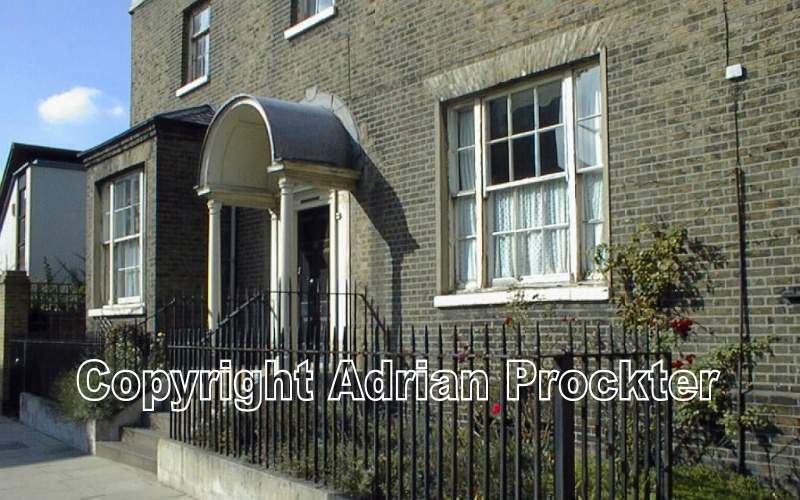 Above: One of a mere handful of elegant houses remaining in Poplar High Street. This flat open land became used by the East India Company for building their ships and for unloading their cargoes in specially constructed docks. The East India Docks were built on part of the land beside the Thames. The workers and their families were granted land by the East India Company on which to build what was known at the time as the Poplar Chapel’. It was the first place of worship in Poplar. Now known as St Matthias Old Church, that chapel remains standing beside Poplar High Street, used as a community centre. As the population increased a new parish of Poplar was created in 1821 from part of the original parish of St Dunstan. A larger church – All Saints, Poplar – was built 1821-23 which still stands in its large churchyard beside East India Dock Road. In 1899 the Metropolitan Boroughs Act was passed and the Metropolitan Borough of Poplar came into existence. It is long and narrow in shape, with the southern end being the whole of the Isle of Dogs. In 1965, Poplar along with the other two Metropolitan Boroughs of Bethnal Green and Stepney were combined to form the London Borough of Tower Hamlets. Above: Map showing the outline in RED of the London Borough of Tower Hamlets. The YELLOW dotted lines show the old Metropolitan Borough boundaries (Bethnal Green top left, Stepney bottom left and Poplar as a long narrow strip of land on the right). Until the 1960s, Poplar’s history was mainly bound up with several dock systems and heavy industry. 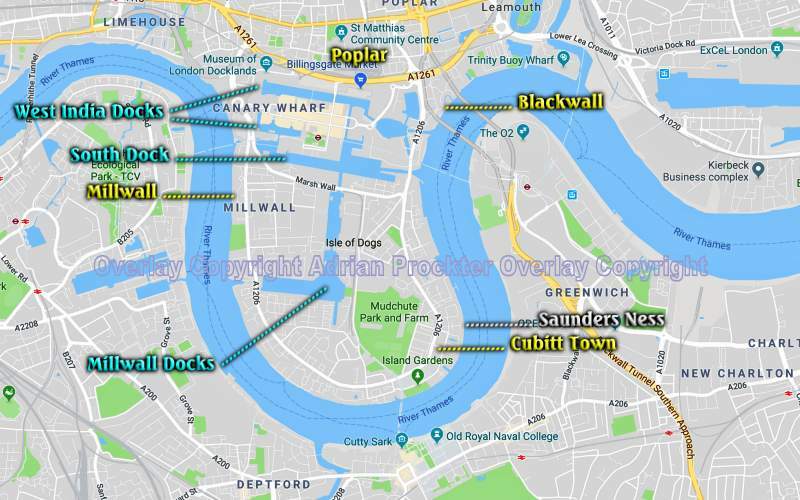 For the docks, the East India Docks, the West India Docks and the Millwall Docks were all within the Metropolitan Borough boundary. For heavy industry, particularly on the Isle of Dogs, there were all manner of factories and also ship-yards. The most famous ship ever built there was, of course, the ‘Great Eastern’, launched in 1858. The use of the docks declined during the 1960s and 1970s, due to an ever growing increase in the value of the land and the change in how cargoes were being handled – due to containerisation. Containers were being handled at Tilbury Docks – much further downriver of Poplar. The land on which the docks stood continued to increase in value which meant that the land on which the warehouses stood was worth more than the goods that were being stored inside. In 1981 the Government of the day created the London Docklands Development Corporation (LDDC) which was made responsible for developing the whole area of the docks in London, of which the Isle of Dogs was an important part. The LDDC had a life span of nearly 20 years until all the infrastructure was in place across the Docklands area – a piece of land the size of the City of Oxford. The Isle of Dogs was no longer a viable place for docks and warehouses and new plans were drawn up to create new roads, new infrastructure, new housing developments and – most importantly – new offices. The most well-known of these was the estate known as Canary Wharf. Canary Wharf Tower – Britain’s tallest building at the time – rising to 770 feet (235 m), was its centrepiece, being officially opened on 26 August 1991. The Canary Wharf Estate continues to grow even today as more tower blocks are being added, almost 40 years after the LDDC was created. Rapid transport was also needed for the area if the new developments were to become successful. The Docklands Light Railway (DLR) was built, with the first part being opened in 1987 – between Island Gardens (on the Isle of Dogs) and two other new termini at Tower Gateway (at the east side of the City of London) and Stratford. In the 1980s, Poplar was still a run-down area with poor housing, few shopping facilities and very few jobs. The creation of the LDDC drove enterprise, creating many new jobs and a considerable amount of new housing. The changes clashed with how the dockers’ families had hoped the land would be developed. The change came rapidly and ‘left behind’ those unwilling to go with the new developments. Those who live on the Isle of Dogs now are a ‘new set’, working at Canary Wharf, with plenty of money and a lavish lifestyle. They are, of course, resented by the families who remember the days of the docks but a change was inevitable and the Isle of Dogs is totally unrecognisable to anyone who remembers life in the 1960s. Just north of the Isle of Dogs and slightly inland from the Thames was the village of Poplar. To its east, beside the Thames, was the ancient hamlet of Blackwall – a spot better known today for the northern entrance to the Blackwall Tunnel. Further north is the village of Bromley by Bow and just north of that is what remains of the ancient village of Bow. Its church was built on the main road out of London and still stands on an island site in the middle of the same road – now known as the busy A11. The church ‘clings onto life’ as heavy traffic thunders past at all hours of the day and the night. Further north again, was a hamlet called Old Ford. It was so-named because it was a fording point over the River Lea before Bow Bridge was built. In the days when Poplar was a Metropolitan Borough, the furthest north of the borough was part of Victoria Park, one of Inner London’s largest public parks. Finally, three canals are shown on the map. Regent’s Canal is only a short distance west of the old Poplar boundary. 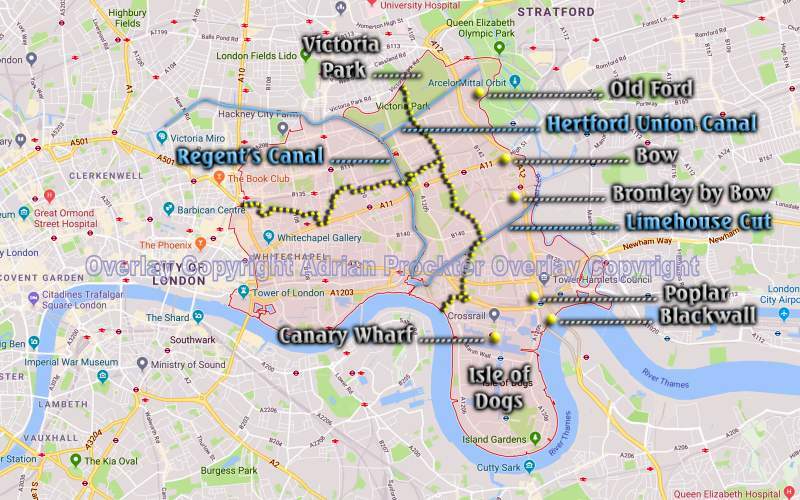 Running across the old Metropolitan Borough of Poplar, almost on the diagonal, is the Limehouse Cut which joins onto the Regent’s Canal at its southern end and connects with the River Lea at Bow Locks. The River Lea forms the eastern boundary of the old Metropolitan Borough of Poplar – now part of the London Borough of Tower Hamlets. Along the southern side of Victoria Park is the Hertford Union Canal whose western end connects with the Regent’s Canal and whose eastern end forms a T-junction with the River Lea. In addition, part of the River Thames forms a boundary around the Isle of Dogs. Above: Map of old Metropolitan London. The boundary lines show all the original Metropolitan Boroughs. Those being considered in this academic year are coloured GREEN. During the remaining months of this academic year, we shall be delving into two London Boroughs. On the north side of the Thames, we look at the old Metropolitan Borough of Poplar – now part of the London Borough of Tower Hamlets. 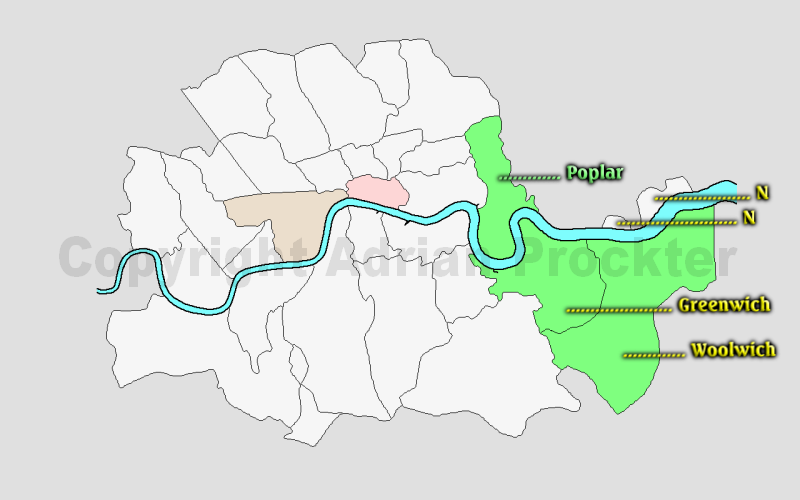 The Metropolitan Borough of Poplar was the furthest east of the Metropolitan London boroughs on the north side of the Thames. On the south side of the Thames is the London Borough of Greenwich which was formed in 1965 from the Metropolitan Borough of Greenwich and the Metropolitan Borough of Woolwich. It should be mentioned that the London Borough of Greenwich had a name change on 3 February 2012 to mark the Diamond Jubilee of Queen Elizabeth II. It is now known as the Royal Borough of Greenwich. Contributing factors were its historic links with the Royal Family – from medieval times onwards – and to its UNESCO World Heritage Site status as the home of the Prime Meridian. One anomaly arises with the old Metropolitan Borough of Woolwich. It will be seen on the above map that there are two small pieces of land on the north side of the Thames marked with the letter ’N’. Although on the opposite side of the Thames to the rest of the Metropolitan Borough of Woolwich they came under the same administration and were known as ‘North Woolwich’. Since the formation in 1965 of the London Boroughs, these two pieces of land have been transferred to the London Borough of Newham. On the south side of the Thames, Metropolitan London extended further east than on the north side of the Thames in the form of the Metropolitan Borough of Woolwich. Having spent the autumn term with a selection of items from the City of London and the spring term on part of the City of Westminster, we now turn our attention to some of the other London Boroughs. This year we look at part of the London Borough of Tower Hamlets and the whole of the London Borough of Greenwich. Above: The site of the Great Exhibition is now a grassed open area, lined by trees. The aerial view shows part of Hyde Park. Part of The Serpentine is at the top right. Part of the road through the park is on the far left and meets up with Exhibition Road (E). Knightsbridge runs along the bottom of the view. The tall building, casting a long shadow is the Knightsbridge Barracks (K). The coloured dots are explained in the text. 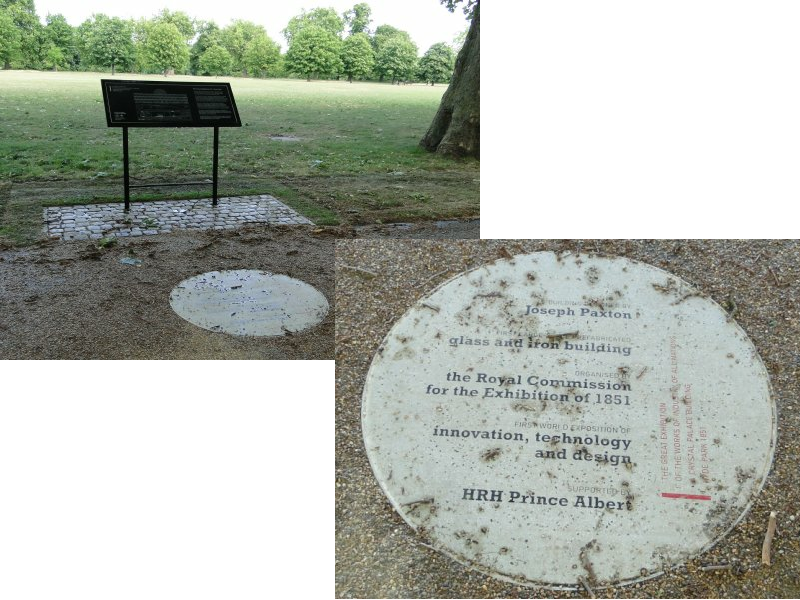 Commemorating the site of the Great Exhibition, in 1851, and to celebrate 160 years of London’s Royal Parks, five plaques were unveiled on 10 May 2011 in Hyde Park. They are still to be seen today. The project, funded by the Royal Commission for the Royal Parks, was to erect five concrete and recycled glass plaques. The enormous building, designed by William Paxton and constructed of glass and steel, using 293,655 panes of glass. The value of the exhibits, excluding the Koh-i-Noor diamond, was around two million pounds. The name ‘Crystal Palace’ came about due to an article in the satirical magazine called ‘Punch’. An article by the playwright Douglas Jerrold, in July 1850 called the building a ‘palace of very crystal’. The plaques, designed by Virginia Nimarkoh, an artist based in London, mark out the original site of the exhibition building which covered ten times the area of St Paul’s Cathedral. Each plaque contains interesting facts about the original exhibition. For example, the exhibition was visited by more than six million people during the five and a half months that it was open. Five markers have been placed on the footpaths and their position is also shown on the top image. The four markers (shown in RED) show the four corners of the structure. The fifth marker (shown in GREEN) shows the main entrance to the building. All five round plaques carry different facts about the Great Exhibition. Above: The fifth marker, at the position of the main entrance to the Great Exhibition. Above: The view of the entire site of the Crystal Palace, It was taken from the approximate site of the eastern edge of the building and looks west with the Albert Memorial just visible in the distance. Above: Part of a map of London by Smith in 1860. For some reason, best known to the mapmaker, the outline of the structure was still shown in the park – nine years after the event! By then the Great Exhibition had been removed from Hyde Park and rebuilt on the top of a large hill at Sydenham, in 1854. After so many years since the Great Exhibition was held, it is high time that these markers were placed in Hyde Park. The structure became greatly loved by the people of Victorian London. It was only intended to be a temporary structure but, when the time came to take it down, there was a clamour by the public to have the structure resited. After a long period of consultation, a position on Sydenham Hill was chosen and led to the immediate area being called Crystal Palace. Sadly, due to a fire, the whole structure was destroyed in 1936. The specially designed park still remains beside Crystal Palace Parade. 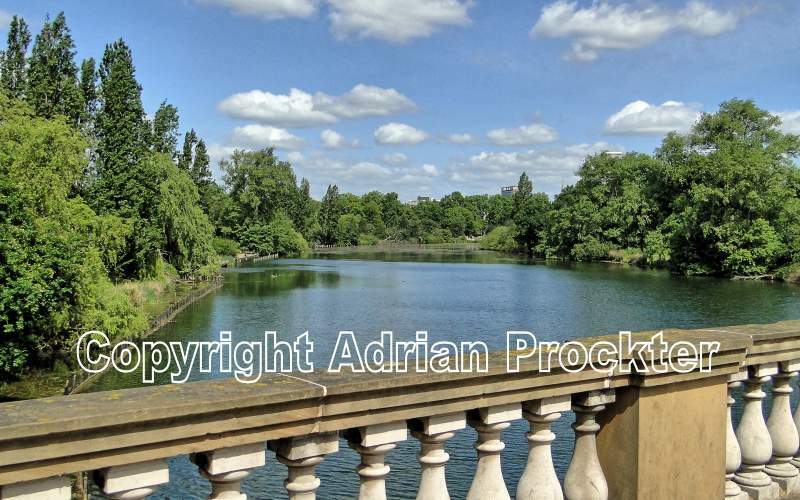 Above: A view of Hyde Park and The Serpentine from the road bridge. The name Hyde is unusual to anyone hearing it for the first time. For Londoners, they are probably so familiar with the name that they have probably never thought much about it. The standard unit of assessment used for tax purposes in the Domesday Book (1086) was the ‘hide’. It was meant to represent the amount of land that could support a household – being roughly 120 acres. There were four virgates to every hide. One theory is that the name ‘Hyde’ came from ‘Hide’ – a measure of land. In early times the land formed a separate Manor of Hyde. It was not mentioned in the Domesday Book (1086) because by that time it was already in the hands of the monks who owned the Manor of Westminster (which included the separate Manors called Ebury, Neate and Hyde). The monks lived at the monastery then known as the Convent of St Peter – now better known as Westminster Abbey. It remained in the hands of Westminster Abbey until 1535 when it was obtained by Henry VIII. Henry enclosed the area of the park to enlarge the hunting land of St James’s Park as a hunting forest in which deer, wild boar and wild bulls roamed freely. The park was enclosed by a brick wall which stood until 1726. Deer were hunted in the park until 1768. The land remained a private hunting ground until James I came to the throne and he permitted limited access. The King appointed a ranger, or keeper, to take charge of the park. It was Charles I who changed the nature of it completely. He had the Ring (north of the present Serpentine boathouses) created and in 1637 he opened the park to the general public. In 1665, the year of the Great Plague, many citizens of London fled the City to camp on land in Hyde Park and other places, in the hope of escaping the disease. Towards the end of the 17th century, William III moved his court to Kensington Palace. He found that his walk to St James’s Palace was very dangerous, so he had 300 oil lamps installed, creating the first artificially lit highway in England. This route later became known as Rotten Row, which is a corruption of the French ‘Route de Roi’ or ‘King’s Road’. Queen Caroline, the wife of George II, had extensive renovations carried out and in the 1730s had The Serpentine created – a lake of some 40 acres (16 hectares). The water came from building a dam across the River Westbourne and letting the stream flood part of the land. The Serpentine Lido was set up in 1930 by George Lansbury, the first Commissioner of Works. Hyde Park became a venue for national celebrations. In 1814 the Prince Regent organised fireworks to mark the end of the Napoleonic Wars. In 1851 the Great Exhibition was held in the park and was opened by Queen Victoria. In 1866, Edmund Beales’ Reform League marched on Hyde Park where great scuffles broke out between the League and the police. Eventually, the Prime Minister allowed the meetings to continue unchallenged and since 1872, people have been allowed to speak at Speaker’s Corner on any subject they wish. Hyde Park is one of London’s eight Royal Parks and covers an area of 350 acres – one of the largest parks in London. Hyde Park adjoins Kensington Gardens – a combined area of 593 acres (240 hectares) which is about one mile (1.6 km) in length from east to west. Apart from temporary structures and smaller buildings for administration, Hyde Park has never been built on at any period in history. Above: A print showing what Knightsbridge Green looked like about 1820. Knightsbridge today is the location of some of the most expensive properties in London. Large impressive buildings – in the form of offices, residential blocks, shops or hotels – dominate the scene and traffic on the streets is as congested as anywhere in Central London. The scene is anything but tranquil and, apart from the nearby Hyde Park, there is not a blade of grass in sight. You may well ask ‘Where is Knightsbridge Green?’ because today it is not even obvious that there was ever such a thing. If you walk down Brompton Road from the Knightsbridge end, there is a small turning on the right that is called Knightsbridge Green. It is almost buried among all the large buildings but, believe it or not, it is the very last remnant of a large green that served as the centre of the hamlet. At the time of the Black Death, which lasted for several years around the peak date of 1349, it is believed that the green was used as a plague pit. Over the last 400 or so years, the green has steadily been encroached on. There was a cattle market held there every Thursday until 1805 and the hitching posts for the animals remained to be seen until 1850. In addition, there was a large maypole on the green which was finally removed in 1800. At the northern end of the green was the local public wooden stocks, removed in 1805. A nearby animal pound was demolished in 1835. On the SW side of the green stood Grosvenor House, later the home of the Gosling family who in 1743 established a famous bank by that name at No 19 Fleet Street. Grosvenor House later became a tenement and was demolished by Tattersalls when they built their headquarters on the site in 1864. Tattersalls is the main auctioneer of racehorses in the United Kingdom and Ireland and the company is now based at Newmarket, in Suffolk. In the crazy modern world in which Londoners live, it is hard to hark back to the simpler times when village greens – like those of Knightsbridge to the west, along with Islington to the north or Camberwell to the south – were just centres for sleepy villages and hamlets. They were on main roads leading to the City of Westminster or the City of London. In this article, we ‘pause for breath’ and try to imagine country air in Knightsbridge. Did someone cough? Above: The area of Knightsbridge is on the south side of Hyde Park. Notice the thin RED line which is part of the boundary of the City of Westminster. There are many things that we still do not know about London. The name of Knightsbridge – which has become the name for a street but also for the area around – is one of the many points of uncertainty. If it was not for the Domesday Book, we would not have early records of many of the villages and hamlets that have made up Inner London. Unfortunately, the early Saxon community at what is now called Knightsbridge was not listed in the Domesday Book so we have no record of the community until a later date. At the time of the Domesday Book (1086), it is more than likely that there was a track leading west where the road called Knightsbridge is today. It is believed to have been part of a Roman road. Adjoining the road were two ancient manors called Hyde and Neyte (or Neate). The ancient Manor of Hyde became the land occupied by Hyde Park is today. The Manor of Neyte was land around today’s modern road called Knightsbridge. There was no separate entry for the Manor of Neyte in the Domesday Book because, by that time, it had become part of the Manor of Westminster, owned by the monks at what is now called Westminster Abbey. The entry in the Domesday Book for Westminster would have included the smaller manors of Hyde and Neyte. The Manor of Westminster was later surrendered to Henry VIII at the Dissolution of the Monasteries (1536). The Old English word ‘neate’ meant ‘cattle, cows or oxen’. The Manor of Neyte extended south to the Thames where there were ‘neat houses’ where, from the 16th century onwards, market gardeners lived. One theory for the name Knightsbridge is that it was derived from the name of the Manor of Neyte. The road leading west through the Manor of Neyte crossed the River Westbourne by a small bridge. That bridge was, therefore, the ‘Neate bridge’ which became corrupted to Knightsbridge. However, the old spellings for this place name were: ‘Cnihtebricge’ in about 1050; ‘Knichtebrig’ in 1235; and ‘Knyghtesbrugg’ in 1364; showing that it has been a place name since at least Norman times. The Old English word ‘cniht’ meant a ‘male of high military rank, ranking below a baron’, usually a young man. In this case, the word was used in the plural form. The Old English word ‘brycg’ gave us the modern word ‘bridge’. So, an approximate translation would be ‘bridge of the young men or knights’. There is a legend that two knights fought to their death on the bridge and that they have been remembered by its name ever since. 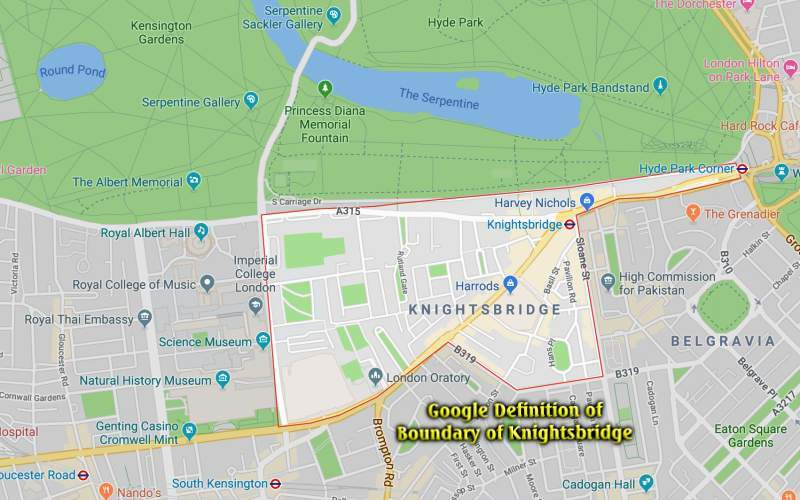 Knightsbridge has no official boundary. It is not an area derived from a parish boundary or anything like that. The northern boundary of the area is, of course, Hyde Park. In simple terms, the boundaries on the other sides are probably part of the boundary of the City of Westminster. Google has its own ideas about where the boundary should be. 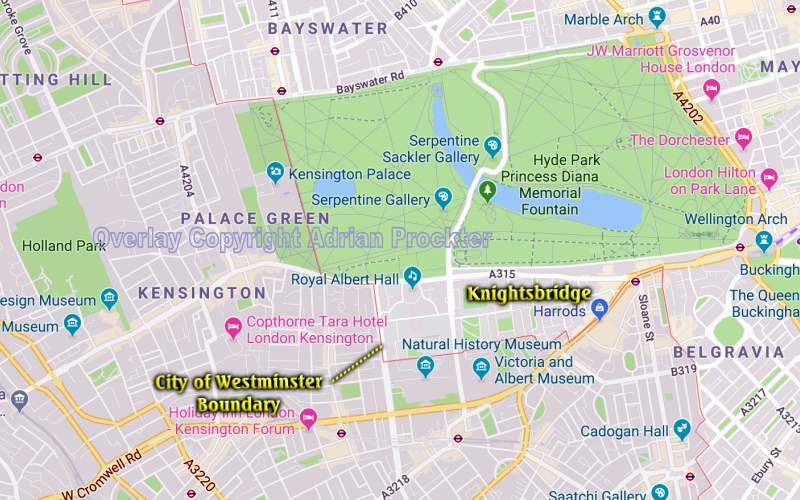 If you search for ‘Google Maps Knightsbridge’ the resulting map – see above – includes parts of the London Borough of Kensington and Chelsea in addition to part of the City of Westminster. The famous store, Harvey Nichols, at the northern end of Sloane Street (in the London Borough of Kensington and Chelsea) almost certainly regards itself as being in Knightsbridge. Similarly, Harrod’s, on the south side of Brompton Road (also in the London Borough of Kensington and Chelsea) refers to itself as ‘a Knightsbridge store’. In these two cases, it is probably because if they said they were in Chelsea (they were until 1965 within the Metropolitan Borough of Chelsea) they were only at the edge of Chelsea which is now centred on King’s Road whose original village was around Chelsea Old Church, at the Chelsea Embankment. Many people also wrongly assume that the road called Knightsbridge is longer than it actually is. It extends west to the junction with Exhibition Road. The continuation is called Kensington Gore (with the Royal Albert Hall beside it) and the continuation further west is Kensington High Street. The famous London museums in Exhibition Road are usually described as being at ‘South Ken’ – meaning they are near the underground station called South Kensington. The museums are never described as being in Knightsbridge. The area of Knightsbridge is essentially a residential and retail district. It is one of two international retail centres in London, the other being the West End. The name of this part of London is certainly associated with the finer things in life – plenty of luxury shops, high-end restaurants and five-star hotels. You would not choose to visit the venues on offer if you were a tourist on a budget.